Dr. Sujata Kapoor, a PhD. 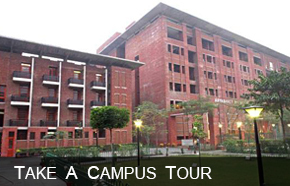 in Corporate Finance is working as an Assistant Professor with Jaypee Business School. She has an experience of over 9 years in teaching. She is responsible for handling advance courses in finance. 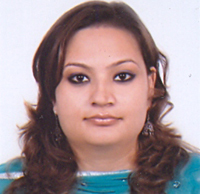 Academically, she has earned MBA (Finance), M.Com and B. Com (Hons.) from prestigious institutes in India. She has to her credit various publications in national and international journals. Jaya M. Prosad, Kapoor Sujata, and Jhumur Sengupta, "An Examination of Herd Behavior: An Empirical Evidence from Indian Equity Market", International Journal of Trade, Economics and Finance (IJTEF), Vol.3(2): 154-157,March 2012. Kapoor,Sujata, and Anil ,Kanwal , "Leading Determinants of Dividend payout Ratios- A study of Indian FMCG sector",Management and Organisation, Vol. 2(2),December 2010. Anil ,Kanwal, and Kapoor,Sujata,"Relevance of Signaling and Smoothing Approaches to Dividend: A study of Indian IT Sector",Asia Pacific Business Review, Vol. IV (4):104-123 ,October-December2008. Anil, Kanwal, and Kapoor,Sujata, "Determinants of Dividend Payout ratios- A study of Indian Information Technology sector",International Research Journal Of Finance and Economics, Issue 15:63-71, May 2008. Anil, Kanwal, and Kapoor,Sujata, "Relevance of Signalling and Smoothing approaches to dividend- A study of Indian FMCG sector", Business Perspectives,Vol.10(1):13-22, Jan-June 2008. Kapoor, Sujata, and Anil, Kanwal "Relevance of Information asymmetry Models-a study of Indian Information technology Sector",International Journal Of Business research Vol.7 (5): 1-9, October 2007. Jaya M. Prosad, Kapoor Sujata, and Jhumur Sengupta, "Behavioral Biases of Indian Investors: A Survey of Delhi-NCR Region”, Qualitative Research in Financial Markets, Emerald Publishing House, Vol.7 (3), 230-263, August 2015. H. K Baker and S.Kapoor,"Why Indian firms engage in stock distributions ", Managerial Finance, Emerald Publishing House, Vol.41 (7), 658-672,July 2015. Kapoor, Sujata, "Dividend policy – A review", Management review, Vol.34:10-14, September, 2007. Kapoor ,Sujata ,"Relevance of information asymmetry models in Indian context" Indian Journal Of Finance, Vol.1(2): 7-12 ,June- July 2007. Jaya M. Prosad, Kapoor, Sujata, and Jhumur Sengupta, "Do overconfidence and disposition effect prevail in Indian Equity market: An Empirical Evidence", India Finance conference, IIM Calcutta, December 2012. Jaya M. Prosad, Kapoor, Sujata, and Jhumur Sengupta, "An Examination of Herd Behavior: An Empirical study on Indian Equity Market", IEDRC India Conference, Chennai, March 2012. Kapoor,Sujata,and Kanwal, Anil, "Determinants of Corporate Dividend Policy in Indian Information Technology Sector: A factorial Analysis", International Finance Conference ,IIM Calcutta ,December 2009. Kapoor,Sujata ,Kanwal, Anil and Abidi, Naseem, "Determinants of dividend payout ratios- A study of Indian FMCG sector", The International Conference on Global Issues in Business and Technology, National Institute of Financial Management, India, August 2008. Kapoor, Sujata, and Kanwal,Anil, "Relevance of Information asymmetry Models-a study of Indian Information Technology Sector", Research / Teaching Excellence in Business and Economics, Las Vegas, Nevada, October 2007. H. Baker Kent and S.Kapoor ,"Dividend Policy in India: New Survey Evidence", Financial Management Association annual meet, October 15th-18th‘2014, Nashville, USA.